Psychology is an academic and applied field involving the scientific study of mental processes and behaviour. Psychology also refers to the application of such knowledge to various spheres of human activity, including problems of individuals' daily lives and the treatment of mental illness. Psychology differs from the other social sciences — anthropology, economics, political science, and sociology — in seeking to explain the mental processes and behaviour of individuals. Psychology differs from biology and neuroscience in that it is primarily concerned with the interaction of mental processes and behaviour on a systemic level, as opposed to studying the biological or neural processes themselves. In contrast, the subfield of neuropsychology studies the actual neural processes and how they relate to the mental effects they subjectively produce. Biological psychology is the scientific study of the biological bases of behaviour and mental states. The word psychology comes from the ancient Greek ψυχή psyche ("soul," "mind") and -λογία, -ology, "study"). The first use of the term psychology is often attributed to the "Yucologia hoc est de hominis perfectione, anima, ortu", written by the German scholastic philosopher Rudolf Goeckel (1547-1628), who often goes by the Latinized Rudolph Goclenius, and published in Marburg in 1590. However, the term was in fact used more than six decades earlier by the Croatian humanist Marko Marulić (1450-1524) in the title of his Latin treatise "Psichiologia de ratione animae humanae." Although the treatise itself has not been preserved, its title appears in a list of Marulic's works compiled by his younger contemporary, Franjo Bozicevic-Natalis in his "Vita Marci Maruli Spalatensis" (Krstić, 1964). This, of course, may not have been the very first usage, but it is the earliest documented use at present. The term did not fall into popular usage until the German idealist philosopher, Christian Wolff (1679-1754) used it in his Psychologia empirica and Psychologia rationalis (1732-1734). This distinction between empirical and rational psychology was picked up in Diderot's Encyclodedie and was popularized in France by Maine de Biran. The root of the word psychology ( psyche) is very roughly equivalent to " soul" in Greek, and psychology came to be considered a study of the soul (in a religious sense of this term) much later, in Christian times. Psychology as a medical discipline can be seen in Thomas Willis' reference to psychology (the "Doctrine of the Soul") in terms of brain function, as part of his 1672 anatomical treatise "De Anima Brutorum" ("Two Discourses on the Souls of Brutes"). Until about the end of the 19th century, psychology was regarded as a branch of philosophy. In 1879, Wilhelm Wundt (1832-1920), known as "the father of psychology", founded a laboratory for the study of psychology at Leipzig University in Germany. The American philosopher William James published his seminal book, Principles of Psychology, in 1890, laying the foundations for many of the questions that psychologists would focus on for years to come. Other important early contributors to the field include Hermann Ebbinghaus (1850–1909), a pioneer in the experimental study of memory at the University of Berlin; and the Russian physiologist Ivan Pavlov (1849-1936), who investigated the learning process now referred to as classical conditioning. 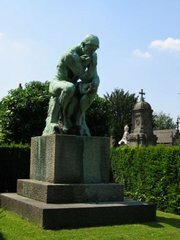 Auguste Rodin's The Thinker, bronze cast by Alexis Rudier, Laeken Cemetery, Brussels, Belgium. Meanwhile, during the 1890s, the Austrian physician Sigmund Freud, who was trained as a neurologist and had no formal training in experimental psychology, had developed a method of psychotherapy known as psychoanalysis. Freud's understanding of the mind was largely based on interpretive methods and introspection, and was focused in particular on resolving mental distress and psychopathology. Freud's theories became very well-known, largely because they tackled subjects such as sexuality and repression as general aspects of psychological development. These were largely considered taboo subjects at the time, and Freud provided a catalyst for them to be openly discussed in polite society. Although Freud's theories are only of limited interest in modern academic psychology departments, his application of psychology to clinical work has been very influential. Partly in reaction to the subjective and introspective nature of Freudian psychology, and its focus on the recollection of childhood experiences, during the early decades of the 20th century behaviorism gained popularity as a guiding psychological theory. Championed by psychologists such as John B. Watson and Edward Thorndike (and later, B.F. Skinner), behaviorism was grounded in studies of animal behaviour. Behaviorists argued that psychology should be a science of behaviour, not the mind, and rejected the idea that internal mental states such as beliefs, desires, or goals could be studied scientifically. In his paper "Psychology as the Behaviorist Views It" (1913), Watson argued that psychology "is a purely objective [emphasis added] experimental branch of natural science," that "introspection forms no essential part of its methods", and that "the behaviorist recognizes no dividing line between man and brute." Behaviorism reigned as the dominant model in psychology through the first half of the 20th century, largely due to the creation of conditioning theories as scientific models of human behaviour, and their successful application in the workplace and in fields such as advertising. However, it became increasingly clear that although behaviorism had made some important discoveries, it was deficient as a guiding theory of human behaviour. Noam Chomsky's review of Skinner's book Verbal Behaviour (that aimed to explain language acquisition in a behaviorist framework) is considered one of the major factors in the ending of behaviorism's reign. Chomsky demonstrated that language could not purely be learned from conditioning, as people could produce sentences unique in structure and meaning that couldn't possibly be generated solely through experience of natural language, implying that there must be internal states of mind that behaviorism rejected as illusory. Similarly, work by Albert Bandura showed that children could learn by social observation, without any change in overt behaviour, and so must be accounted for by internal representations. Humanistic psychology emerged in the 1950s and has continued as a reaction to positivist and scientific approaches to the mind. It stresses a phenomenological view of human experience and seeks to understand human beings and their behaviour by conducting qualitative research. The humanistic approach has its roots in existentialist and phenomenological philosophy and many humanist psychologists completely reject a scientific approach, arguing that trying to turn human experience into measurements strips it of all meaning and relevance to lived existence. Some of the founding theorists behind this school of thought were Abraham Maslow who formulated a hierarchy of human needs, Carl Rogers who created and developed Client-centred therapy, and Fritz Perls who helped create and develop Gestalt therapy. However, many psychologists have not been happy with what they perceive as 'mechanical' models of the mind and human nature. Coming full circle, Transpersonal psychology and the Analytical Psychology of Carl Jung seek to return psychology to its spiritual roots. Others, such as Serge Moscovici and Gerard Duveen, argue that behavior and thought are essentially social in nature and seek to embed psychology in a broader social scientific study that incorporates the social meaning of experience and behaviour. Psychology describes and attempts to explain consciousness, behavior and social interaction. Empirical psychology is primarily devoted to describing human experience and behaviour as it actually occurs. In the past 20 years or so psychology has begun to examine the relationship between consciousness and the brain or nervous system. It is still not clear in what ways these interact: does consciousness determine brain states or do brain states determine consciousness - or are both going on in various ways? Perhaps to understand this you need to know the definition of "consciousness" and "brain state" - or is consciousness some sort of complicated 'illusion' which bears no direct relationship to neural processes? An understanding of brain function is increasingly being included in psychological theory and practice, particularly in areas such as artificial intelligence, neuropsychology, and cognitive neuroscience. Various schools of thought have argued for a particular model to be used as a guiding theory by which all, or the majority, of human behaviour can be explained. The popularity of these has waxed and waned over time. Some psychologists may think of themselves as adherents to a particular school of thought and reject the others, although most consider each as an approach to understanding the mind, and not necessarily as mutually exclusive theories. Psychology is an extremely broad field, encompassing many different approaches to the study of mental processes and behaviour. Below are the major areas of inquiry that comprise psychology. A comprehensive list of the sub-fields and areas within psychology can be found at the list of psychological topics and list of psychology disciplines. Research psychology encompasses the study of behaviour for use in academic settings, and contains numerous areas. It contains the areas of abnormal psychology, biological psychology, cognitive psychology, comparative psychology, developmental psychology, personality psychology, social psychology and others. Research psychology is contrasted with applied psychology. Abnormal psychology is the study of abnormal psychological behaviour in order to describe, predict, explain, and change abnormal patterns of functioning. Abnormal psychology studies the nature of psychopathology and its causes, and this knowledge is applied to treating patients with psychological disorders in clinical psychology. The Diagnostic and Statistical Manual of Mental Disorders, published by the American Psychiatric Association, is the handbook used most often in diagnosing mental disorders in the United States. Image of the human brain. 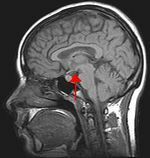 The arrow indicates the position of the hypothalamus. Biological psychology is the scientific study of the biological bases of behavior and mental states. Because all behaviour is controlled by the central nervous system, it is sensible to study how the brain functions in order to understand behaviour. This is the approach taken in behavioural neuroscience, cognitive neuroscience, and neuropsychology. Neuropsychology is the branch of psychology that aims to understand how the structure and function of the brain relate to specific behavioural and psychological processes. Often neuropsychologists are employed as scientists to advance scientific or medical knowledge. Neuropsychology is particularly concerned with the understanding of brain injury in an attempt to work out normal psychological function. The approach of cognitive neuroscience to studying the link between brain and behaviour is to use neuroimaging tools, such as fMRI, to observe which areas of the brain are active during a particular task. Neural network with two layers. The nature of thought is another core interest in psychology. Cognitive psychology studies cognition, the mental processes underlying behaviour. It uses information processing as a framework for understanding the mind. Perception, learning, problem solving, memory, attention, language and emotion are all well researched areas. Cognitive psychology is associated with a school of thought known as cognitivism, whose adherents argue for an information processing model of mental function, informed by positivism and experimental psychology. Cognitive science is very closely related to cognitive psychology, but differs in some of the research methods used, and has a slightly greater emphasis on explaining mental phenomena in terms of both behaviour and neural processing. Both areas use computational models to simulate phenomena of interest. Because mental events cannot directly be observed, computational models provide a tool for studying the functional organization of the mind. Such models give cognitive psychologists a way to study the "software" of mental processes independent of the "hardware" it runs on, be it the brain or a computer. Comparative psychology refers to the study of the behaviour and mental life of animals other than human beings. It is related to disciplines outside of psychology that study animal behaviour, such as ethology. Although the field of psychology is primarily concerned with humans, the behaviour and mental processes of animals is also an important part of psychological research, either as a subject in its own right (e.g., animal cognition and ethology), or with strong emphasis about evolutionary links, and somewhat more controversially, as a way of gaining an insight into human psychology by means of comparison or via animal models of emotional and behaviour systems as seen in neuroscience of psychology (e.g., affective neuroscience and social neuroscience). How do infants experience the world? Personality psychology studies enduring psychological patterns of behaviour, thought and emotion, commonly called an individual's personality. Theories of personality vary between different psychological schools. Trait theories attempts to break personality down into a number of traits, by use of factor analysis. The number of traits have varied between theories. One of the first, and smallest, models was that of Hans Eysenck, which had three dimensions: extraversion— introversion, neuroticism—emotional stability, and psychoticism. Raymond Cattell proposed a theory of 16 personality factors. The theory that has most empirical evidence behind it today may be the " Big Five" theory, proposed by Lewis Goldberg and others. A different, but well known, approach to personality is that of Sigmund Freud, whose structural theory of personality divided personality into the ego, superego, and id. Freud's theory of personality has been criticized by many, including many mainstream psychologists. Psychometrics is the field of psychology concerned with the theory and technique of psychological measurement, which includes the measurement of knowledge, abilities, attitudes, and personality traits. The field is primarily concerned with the study of differences between individuals. It involves two major research tasks, namely: (i) the construction of instruments and procedures for measurement; and (ii) the development and refinement of theoretical approaches to measurement. Much of the early theoretical and applied work in psychometrics was undertaken in an attempt to measure intelligence. The origin of psychometrics has connections to the related field of psychophysics. Charles Spearman, a pioneer in psychometrics who developed approaches to the measurement of intelligence, studied under Wilhelm Wundt and was trained in psychophysics. The psychometrician L. L. Thurstone later developed and applied a theoretical approach to the measurement referred to as the law of comparative judgment, an approach which has close connections to the psychophysical theory developed by Ernst Heinrich Weber and Gustav Fechner. In addition, Spearman and Thurstone both made important contributions to the theory and application of factor analysis, a statistical method that has been used extensively in psychometrics. More recently, psychometric theory has been applied in the measurement of personality, attitudes and beliefs, academic achievement, and in health-related fields. Measurement of these unobservable phenomena is difficult, and much of the research and accumulated art in this discipline has been developed in an attempt to properly define and quantify such phenomena. Critics, including practitioners in the physical sciences and social activists, have argued that such definition and quantification is impossibly difficult, and that such measurements are often misused. Proponents of psychometric techniques can reply, though, that their critics often misuse data by not applying psychometric criteria, and also that various quantitative phenomena in the physical sciences, such as heat and forces, cannot be observed directly but must be inferred from their manifestations. Figures who made significant contributions to psychometrics include Karl Pearson, L. L. Thurstone, Georg Rasch and Arthur Jensen. Social psychology is the study of the nature and causes of human social behavior, with an emphasis on how people think towards each other and how they relate to each other. Social Psychology aims to understand how we make sense of social situations. For example, this could involve the influence of others on an individual's behaviour (e.g., conformity or persuasion), the perception and understanding of social cues, or the formation of attitudes or stereotypes about other people. Social cognition is a common approach and involves a mostly cognitive and scientific approach to understanding social behaviour. A related area is community psychology, which examines psychological and mental health issues on the level of the community rather than using the individual as the unit of measurement. " Sense of community" has become its conceptual centre (Sarason, 1986; Chavis & Pretty, 1999). Applied psychology encompasses both psychological research that is designed to help individuals overcome practical problems and the application of this research in applied settings. Much of applied psychology research is utilized in other fields, such as business management, product design, ergonomics, nutrition, and clinical medicine. Applied psychology includes the areas of clinical psychology, industrial and organizational psychology, human factors, forensic psychology, health psychology, school psychology and others. Clinical psychology is the application of abnormal psychology research to the understanding, treatment, and assessment of psychopathology, including behavioural and mental health issues. It has traditionally been associated with psychological treatment and psychotherapy, although modern clinical psychology may take an eclectic approach, including a number of therapeutic approaches. Typically, although working with many of the same clients as psychiatrists, clinical psychologists do not prescribe psychiatric drugs. Some clinical psychologists may focus on the clinical management of patients with brain injury. This area is known as clinical neuropsychology. In recent years and particularly in the United States, a major split has been developing between academic research psychologists in universities and some branches of clinical psychology. Many research psychologists believe that many contemporary clinicians use therapies based on discredited theories and unsupported by empirical evidence of their effectiveness. From the other side, these clinicians believe that the research psychologists are ignoring their experience in dealing with actual patients. The disagreement resulted in the formation of the Association for Psychological Science by the research psychologists as a new body distinct from the American Psychological Association. The majority of work performed by clinical psychologists tends to be done inside a Cognitive-Behaviorial therapy (CBT) framework. CBT is an umbrella term that refers to a number of therapies which focus on changing cognitions and/or behaviors, rather than changing behaviour exclusively, or discovering the unconscious causes of psychopathology (as in the psychodynamic school). The two most famous CBT therapies are Aaron T. Beck's cognitive therapy and Albert Ellis's rational emotive behaviour therapy (with cognitive therapy being, by far, the most extensively studied therapy in contemporary clinical psychology). Counseling psychology as a psychological specialty facilitates personal and interpersonal functioning across the life span with a focus on emotional, social, vocational, educational, health-related, developmental, and organizational concerns. Counseling psychology differs from clinical psychology in that it is focused more on normal developmental issues and everyday stress as opposed to severe mental disorders. Counseling psychologists are employed in a variety of settings, including universities, private practice, businesses, and community mental health centers. The emerging field of relationship counseling which seeks to describe typical human relationship successes and failures in rather concrete form, has the very specific appeal of avoiding psychology's rather universal assignation of pathology on all persons who seek assistance. Current health insurance reimbursement for psychological services commonly involves the assignment of mental disease nomenclature, a feature that potential consumers might find offensive, and other practitioners might find iatrogenic. Relationship counseling, also referred to as relationship education, includes psychologists, psychiatrists, and social workers. It is based on decades of university based research, specifically through the observation and analysis of both successful and unsuccessful marriages and family units. Important names in this field are John Gottman, Diane Sollee, Howard Markman, Scott Stanley, Bill Doherty and Michelle Weiner-Davis. Educational psychology is the study of how humans learn in educational settings, the effectiveness of educational interventions, the psychology of teaching, and the social psychology of schools as organizations. The work of child psychologists such as Lev Vygotsky, Jean Piaget and Jerome Bruner has been influential in creating teaching methods and educational practices. Forensic psychology is the area concerned with the application of psychological methods and principles to the legal arena. Most typically, forensic psychology involves a clinical analysis of a particular individual and an assessment of some specific psycho-legal question. Typically, referrals to forensic practices constitute assessments for individuals that have ostensibly suffered neurologic insult(s). These patients have sought legal recourse, and the job of the forensic psychologist is to demonstrate that there is or is not (depending on their employ by either the prosecution or defense) a cause-and-effect relation between the accident and the subsequent (again, ostensible) neurologic change. A job required of the forensic psychologist in any case is the detection of malingering, although this is not exclusive to forensics. Health psychology is the application of psychological theory and research to health, illness and health care. Whereas clinical psychology focuses on mental health and neurological illness, health psychology is concerned with the psychology of a much wider range of health-related behaviour including healthy eating, the doctor-patient relationship, a patient's understanding of health information, and beliefs about illness. Health psychologists may be involved in public health campaigns, examining the impact of illness or health policy on quality of life or in research into the psychological impact of health and social care. Human factors psychology is the study of how cognitive and psychological processes affect our interaction with tools and objects in the environment. The goal of research in human factors psychology is to better design objects by taking into account the limitations and biases of human mental processes and behaviour. Industrial and organizational psychology (I/O) is among the newest fields in psychology. Industrial Psychology focuses on improving, evaluating, and predicting job performance while Organizational Psychology focuses on how organizations impact and interact with individuals. In 1910, through the works and experiments of Hugo Munsterberg and Walter Dill Scott, Industrial Psychology became recognized as a legitimate part of the social science . Organizational Psychology was not officially added until the 1970s and since then, the field has flourished. The Society for Industrial Organizational Psychology has approximately 3400 professional members and 1900 student members. These two numbers combine to make up only about four percent of the members in the American Psychology Association but the number has been rising since 1939 when there were only one hundred professional I/O psychologists . I/O psychologists are employeed by academic institutions, consulting firms, internal human resources in industries, and governmental institutions. Various universities across the United States are beginning to strengthen their I/O Psychology programs due to the increase of interest and job demand in the field . Industrial organizational psychologists look at questions regarding things such as who to hire, how to define and measure successful job performance, how to prepare people to be more successful in their jobs, how to create and change jobs so that they are safer and make people happier, and how to structure the organization to allow people to achieve their potential. School psychology is the area of discipline that is dedicated to helping young people succeed academically, socially, and emotionally. School psychologists collaborate with educators, parents, and other professionals to create safe, healthy, and supportive learning environments for all students that strengthen connections between home and school. They are trained to be experts in educational and behavioural assessment, intervention, prevention, and consultation, and many have extensive training in research. Currently, school psychology is the only field in which a professional can be called a "psychologist" without a doctoral degree, with the National Association of School Psychologists (NASP) recognizing the Specialist degree as the entry level. This is a matter of controversy, however, as the APA does not recognize anything below a doctorate as the entry level for a psychologist. Specialist-level school psychologists, who typically receive three years of graduate training, function almost exclusively within school systems, while those at the doctoral-level are found in a number of other settings as well, including universities, hospitals, clinics, and private practice. Psychology has, of course, had a profound impact on the arts and their definition in the twentieth century. One of the earliest to integrate psychology with art history was Heinrich Wölfflin (1864 – 1945), a Swiss art critic and historian, whose dissertation Prolegomena zu einer Psychologie der Architektur (1886)attempted to show that architecture could be understood from a purely psychological (as opposed to a historical-progressivist) point of view. Though first developed in Germany, there were soon advocates of art psychology in the USSR, France ( André Malraux), and the US. In the US, the philosophical premises of art psychology were strengthened - and given political valence - in the work of John Dewey. His Art as Experience was published in 1932, and was the basis for significant revisions in teaching practices whether in the kingergarten or in the university. The impact of psychology was particularly strong between 1950 and 1970 when it coincided with the expansion of art history and museum programs, as well as with the development in the post-WWII years of expanded undergraduate teaching curriculi. The writings of Rudolf Arnheim (born 1904) were particularly influential. His Toward a Psychology of Art (Berkeley: University of California Press) was published in 1966. By the 1970s, the centrality of art psychology in academe began to wane. Artists became more interested in psychoanalysis, and architects in phenomenology and the writings of Derrida. As for art and architectural historians, they critiqued psychology for being anti-contextual and culturally naive. Today, psychology still plays an important role in art discourse, though mainly in the field of art appreciation. Wilhelm Maximilian Wundt was a German psychologist, generally acknowledged as a founder of experimental psychology. Experimental psychological research is conducted in the laboratory under controlled conditions. This method of research attempts to rely solely on an application of the scientific method to understand behavior and mental processes. Examples of such measurements of behaviour include reaction time and various psychometric measurements. Experiments are conducted to test a particular hypothesis. As an example of a psychological experiment, one may want to test people's perception of different tones. Specifically, one could ask the following question: is it easier for people to discriminate one pair of tones from another depending upon their frequency? To answer this, one would want to disprove the hypothesis that all tones are equally discriminable, regardless of their frequency. (See hypothesis testing for an explanation of why one would disprove a hypothesis rather than attempt to prove one.) A task to test this hypothesis would have a participant seated in a room listening to a series of tones. If the participant would make one indication (by pressing a button, for example) if they thought the tones were two different sounds, and another indication if they thought they were the same sound. The proportion of correct responses would be the measurement used to describe whether or not all the tones were equally discriminable. The result of this particular experiment would probably indicate better discrimination of certain tones based on the human threshold of hearing. A longitudinal study is a research method which observes a particular population over time. For example, one might wish to study specific language impairment (SLI) by observing a group of individuals with the condition over a period of time. This method has the advantage of seeing how a condition can affect individuals over long time scales. However, since individual differences between members of the group are not controlled, it may be difficult to draw conclusions about the populations. Cognitive neuropsychology and cognitive neuropsychiatry study neurological or mental impairment in an attempt to infer theories of normal mind and brain function. This typically involves looking for differences in patterns of remaining ability (known as 'functional disassociation's') which can give clues as to whether abilities are comprised of smaller functions, or are controlled by a single cognitive mechanism. In addition, experimental techniques are often used which also apply to studying the neuropsychology of healthy individuals. These include behavioural experiments, brain-scanning or functional neuroimaging - used to examine the activity of the brain during task performance, and techniques such as transcranial magnetic stimulation, which can safely alter the function of small brain areas to investigate their importance in mental operations. Computational modeling is a tool often used in cognitive psychology to simulate a particular behaviour using a computer. This method has several advantages. Since modern computers are extremely fast, many simulations can be run in a short time, allowing for a great deal of statistical power. Modeling also allows psychologists to visualise hypotheses about the functional organization of mental events that couldn't be directly observed in a human. Several different types of modeling are used to study behaviour. Connectionism uses neural nets to simulate the brain. Another method is symbolic modeling, which represents many different mental objects using variables and rules. Other types of modeling include dynamic systems and stochastic modeling. Although modern mainstream psychology largely attempts to be a scientific endeavour, the field has a history of controversy. Some criticisms of psychology have been made on ethical and philosophical grounds. Some have argued that by subjecting the human mind to experimentation and statistical study, psychologists objectify persons; because it treats human beings as things, as objects that can be examined by experiment, psychology is sometimes portrayed as dehumanizing, ignoring or downplaying what is most essential about being human. A common criticism of psychology concerns its fuzziness as a science. Since some areas of psychology rely on "soft" research methods such as surveys and questionnaires, some have said that those areas of psychology are not as scientific as psychologists claim. Methods such as introspection and expert analysis, used by some psychologists, are open to subjectivity and rely on speculation. The question has been raised whether psychology should be classified as a science, because objectivity, validity, and rigour are key attributes one rule for empiricism and science, and some approaches to psychology have fallen short on these criteria, notably though not uniquely psychodynamic theory and introspection. On the other hand, greater use of statistical controls and increasingly sophisticated research design, analysis, and statistical methods, as well as a decline - at least within academic psychology departments - in the use of some of the more problematic methods such as introspection, have lessened the impact of this criticism to some degree. Debates continue, however, with questions regarding factor indeterminacy and external validity, as well as questions of the effectiveness of "Null Hypothesis Testing" as a valid research tool. In particular, a concern often raised is that null hypothesis testing, especially with large samples, may promote rather trivial findings as meaningful. There is also concern from researchers concerning a perceived scientific gap between research and clinical practice in psychology. For example, therapies such as neurolinguistic programming, rebirthing, and primal therapy have gained popularity in recent years despite a lack of empirical evidence of their effectiveness. Those who support the controversial methods often argue that therapy is an individual process, and broad examinations of effectiveness may not produce accurate pictures for how any given individual will respond to them; detractors of specific unsupported therapies or pseudoscientific psychological theories on the other hand feel that any claims of effectiveness cannot be made unless the techniques are empirically found to provide general results that are clearly different from no therapy at all.